Creating "ambience" in a bowling alley is not easy. "Going Green" added yet another dimension to our challenge. 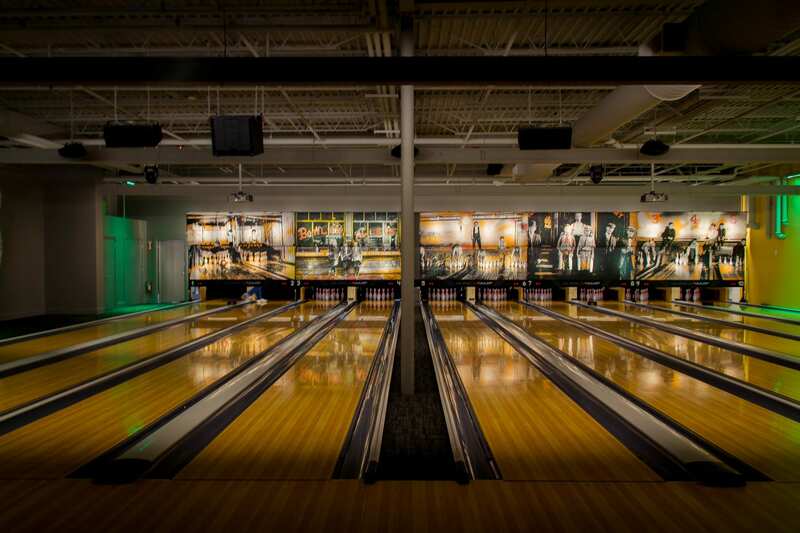 When deciding on a look for the bowling lanes and the adjacent bistro, we were inspired by turn-of-the-century bowling alleys typically housed in the basements of halls and public buildings. During the Industrial Age, working people labored for long hours under difficult conditions. In their free time they enjoyed the recreation and camaraderie that simple and affordable games like bowling provided. Our intention is that The Lanes Bowl & Bistro recalls the atmosphere of those early bowling halls. Embracing our re-purposed space (the old Shaw's Market), we challenged ourselves to meld aspects of the old halls with our mission to re-claim, re-use, and totally re-create the bowling experience. Our "Vintage Industrial" vision combines an old factory feel with urban edginess… enter a turn-of-the-century bowling alley that explodes with colorful lighting and punchy graphics of pin boys at the end of the lanes. The label "Vintage Industrial" is a hot trend in design today. The term is often misapplied to mass-produced products of new wood and fittings distressed to look old. In our quest for "green" goods, we became acquainted with various craftsmen and fabricators who work solely in re-claimed woods, salvaged metals and use only LEED compliant finishes along with eco-friendly, recycled, sustainable materials available in today's market. • Our tables were crafted at Powerhouse Industrial in Western MA using planks, pipe, and fittings from old mills and factories in New England. • Bistro bar stools and chairs, made in Pennsylvania, feature seats & backs woven out of surplus automotive seatbelts once destined for the landfill. • Bar, counter and table tops are made of recycled paper. The Lanes Bowl & Bistro at Mashpee Commons is proud to participate in ConSERVE TM A Greener Choice Restaurant, a National Restaurant Association educational program that assists restaurants in conserving natural resources and preserving our environment. The Lanes is committed to implementing best practices in 67 modules as specified by the ConSERVE Action Plan. • The majority of our soft drinks and beers are on tap. • HVAC features CO2 sensors, variable frequency drive and air-side economizers.